Wow, it's Thanksgiving week already. Today's card is an Upright Diamond Fold Card. I love fancy fold cards. This one was fun to make, but I had a hard time taking pictures of it. It is hard to stand upright closed. This is the front of the card. This is the card opened up. This is the card from the back opened up. 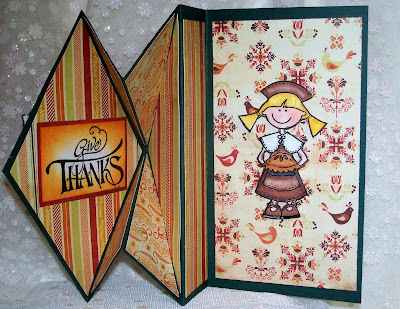 I found the tutorial for this card HERE on Split Coast Stampers. This is one stamp, I fussy cut the boy and girl and pup out and put the girl inside. 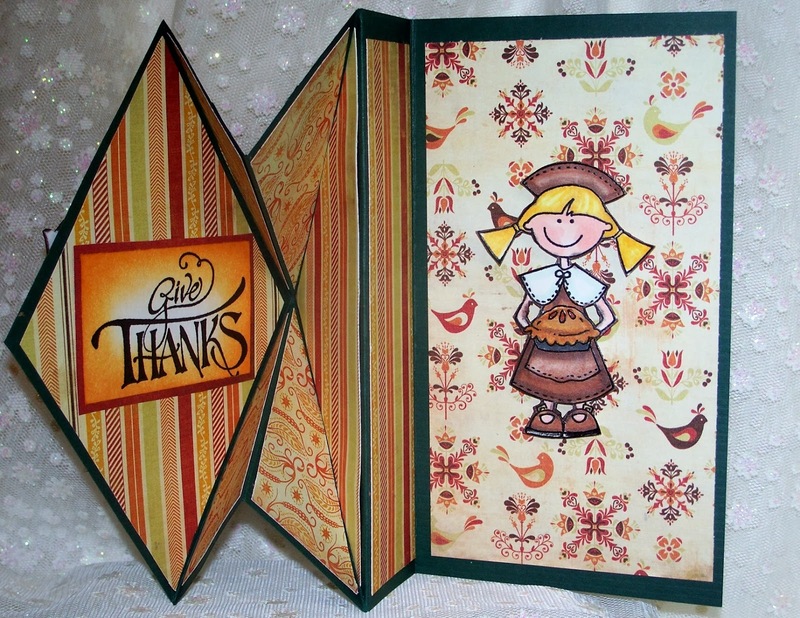 are from the 6x6 Thanksgiving Authentique paper pack. Wild honey distress ink sponged around sentiment. Images are Popped up on diamond.and inside. Thanks for stopping in today. Have a great day. Until later. WOW! Such a wonderful card design Sue. I love the cute image and gorgeous papers too. Oh WOW!! 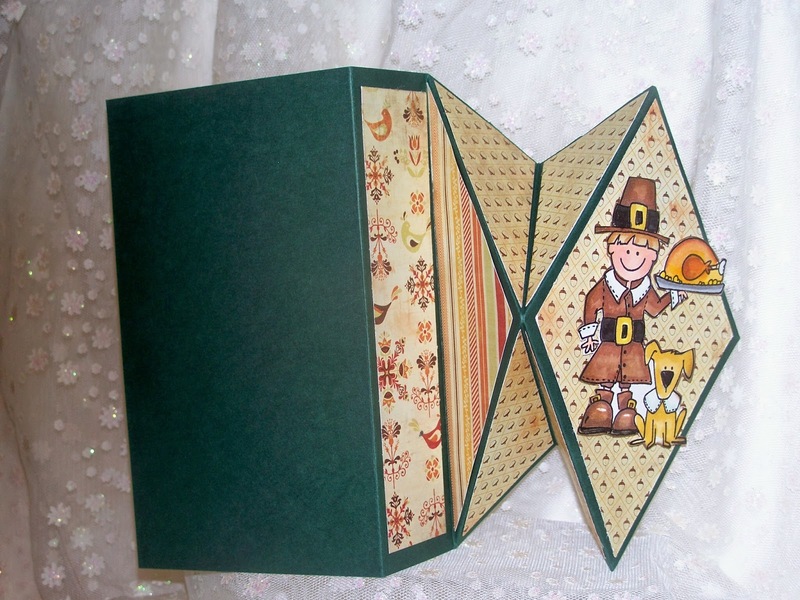 Love that Thanksgiving tri-fold card. Fabulous papers and adorable images. Oh WOW, this fold is awesome. You have inspired me to try this one out. 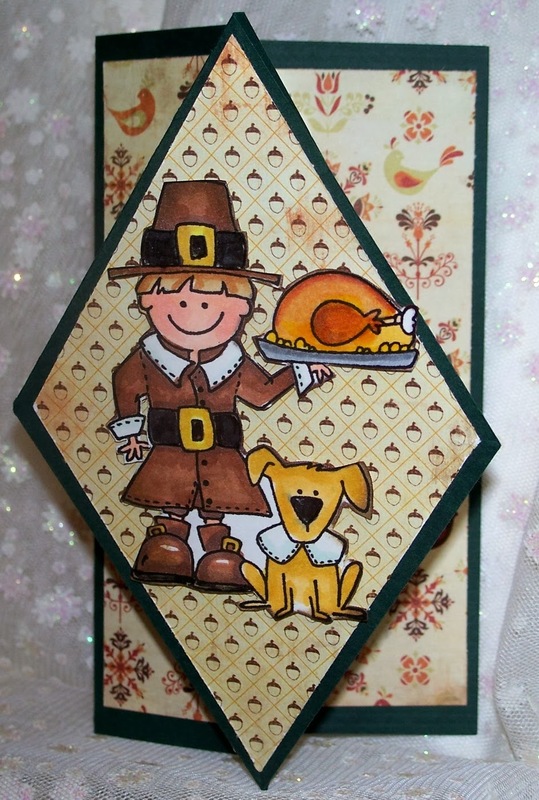 Your card is so cute and perfect for the Thanksgiving Week Festivities. 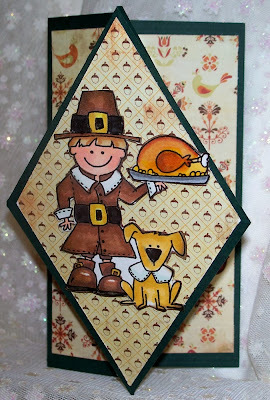 Like everyone else my festivities include running home from work each night to peel, chop, and bake.....lol Oh those Pilgrims....see what they've done!!!! Too wonderful, love it, what a fab shape and the image and design is just right for this time of year!.